located in the Chūbu region of central Japan. Its capital is the city of Gifu. 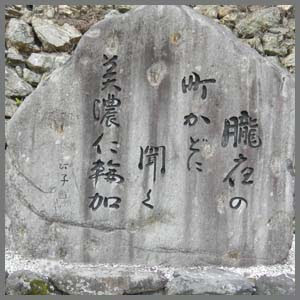 Located in the center of Japan, it has long played an important part as the crossroads of Japan, connecting the east to the west through such routes as the Nakasendō. 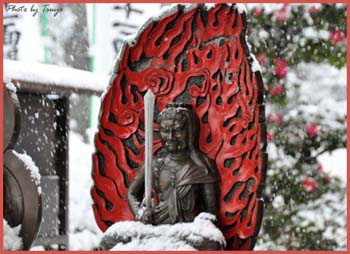 During the Sengoku period, many people referred to Gifu by saying, "control Gifu and you control Japan." 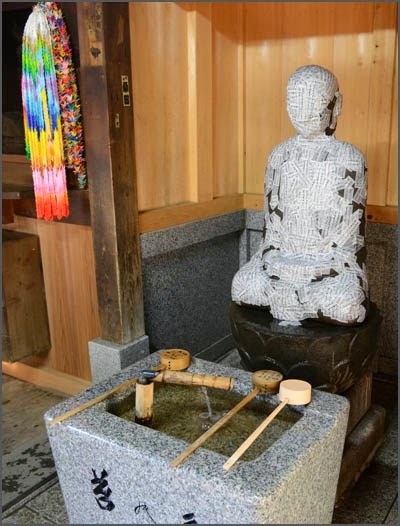 as well as smaller parts of Echizen and Shinano.
. Gifu - Entries of this BLOG . 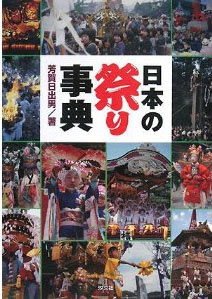 Sukuna Festival at Nyukawa . “Okoshi Daiko (Wakening Drum)” known in Japan as the most eccentric festival. This festival can be described as a combination of naked and fighting festival. Only this day, this quiet little town becomes tumult with the intense fights among naked men. Then, on the following day, April 20, the atmosphere changes completely and graceful stalls parade around the town of Furukawa. Harmony of “Movement and Quietness”, this is the Furukawa Festival. All of a sudden, you hear, “Boom! Thud! Boom!” You can feel the succession of pounding sounds of drums vibrating your body. Simultaneously, the large chorus of “Zenzenoko” celebratory song begins. They wear white headband, white “tabi (Japanese socks)” and stomach band made from bleached cotton. Hida in mid April is still chilly and blows cold wind at night, but it has no effect to their body heated with sake and high spirits. It is their proudest moment at the year of "Furukawa Yancha (Adventure)." nine stalls that Furukawa people are proud of are lined up. People in Furukawa often say, “Don’t say you saw the Furukawa Festival just by seeing the wakening drum.” Certainly, you cannot say you’ve seen the Furukawa Festival without experiencing the glorious stalls, Honraku Festival 本楽祭 （and “Mikoshi (portable shrine)” parade. Hiding the remaining pain after the intense battle from previous night, the young men of Furukawa parade around the town pull these “Movable Youmei-Mon (gate)”. The stall made by “Takumi (the Master)” of Hida from his heart and soul represents the traditional beauty and craft beauty, while magnificence and glorious, and profoundness and melancholy fuse at just right level. At the night of Honraku Festival, the gloriously stalls decorated with gorgeous lanterns parade within the town showing the fantasy world. There is a museum with the drums on display in Furukawa. 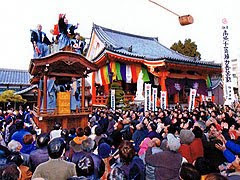 Town festival of the 'Hachiman' Shrine of Mino. On the first day, over 30 portable shrines are decorated as 'Hana-mikoshi 花みこし' (flower-palanquins); more than 200 branches of attached flowers for 'hana-mikoshi' are made of 'washi' (Japanese paper) dyed a cherry colour and carried to the central shrine of the town by a joyful procession of young men gathered from several districts. A parade of six gorgeous 'Yama 山車' (wheeled floats) with open-air stand of wind-up dolls takes place on the following day. 'Niwaka　流しにわか' (street comedy with teams of amateur comedians) entertains audience the evening of both days. The floats date back to the Edo period, some have mechanical dolls on them 'karakuri ningyo からくり人形". This festival takes place on February 18 in the village Tanigumi in Gifu prefecture. This festival has a history of more than 800 years to the war of the Genji and the Heike. The victorious soldiers celebrated the return to Kamakura with this dance, which was then called "Kamakura Dance, Kamakura odori 鎌倉踊". During the Edo period this kind of dance was also performed to pray for rain at the local shrines. This dance had become almost obsolete about 40 years ago, but was then revitalized by the villagers of Tanikumi. Now it is a great tourist attraction. 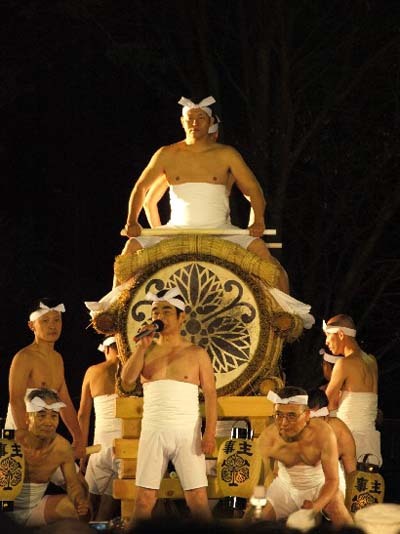 Dancers carry a large "shinai しない " on the back and a big drum of 70 cm diameter on the chest. Shinai is made from bamboo like the feathers of a "phoenix" bird. The dancers are acompanied by a special music troupe. They perform various dances called 道行き, 車切り, 馬車, 拍子, 倉間, ひねり and others. People a wish for an abundant harvest. The festival takes place at the temple Kegonji (Kagenji) 華厳寺（けごんじ） and in front of the station of Tanikumi village. Pilgrims wet a part of Jizo where their own body hurts and plaster a paper amulet on this place with the prayer to get well soon. Now the Jizo looks almost like a mummy. in the hall Oizuridoo 笈摺堂 Oizuri-Do, a small hall in the back of the temple compound. This hall is famous, because the tenno Hanayama 花山法皇 (968 - 1008) dedicated some poems to it. The most famous is Oizuru 笈摺 (Cleaning the bucket of a pilgrim). This hall is now the last of the pilgrimage of 33 Kannon Temples in Western Japan 西国三十三所巡礼. 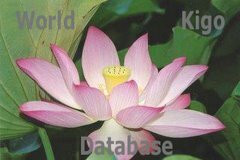 LOOK at many photos !
. 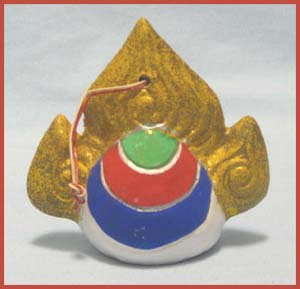 Amulets to heal a disease .